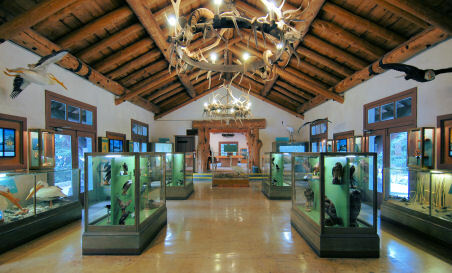 The Fishing Bridge Museum, located inside the visitor center, is dedicated to birds. More than 300 species of birds frequent Yellowstone, including Bald Eagles, song sparrows, sand cranes and four different species of herons. Mounted displays of many of these species reside at the museum, providing an up-close examination of some of Yellowstone's most enduring residents. Although the displays are not meant to pay homage to any one species or ecological area of the park, one of the best areas to catch a glimpse of aviary life is along Yellowstone Lake's shoreline, near the museum. 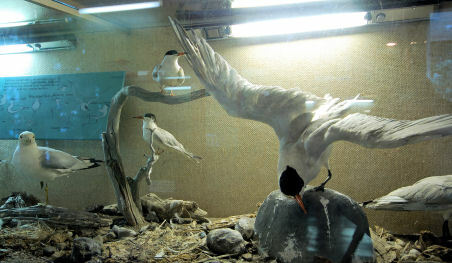 Therefore, it isn't surprising that the park's largest bird museum is located at its water's edge.